Tween Yoga is a special offering for kids ages 10-13! Use code "SIBLINGDISCOUNT" at checkout to receive 10% off a sibling enrolled in this series. In our special Kids Yoga & Mindful Art Workshops for ages 6-10 we will learn skills that can enhance their everyday lives in learning mindfulness, visualization and concentration strategies. We will have fun in building strength, flexibility, and team/partner yoga poses! Singing, Dancing, art, and being creative is all part of our Kids Yoga experience! This is one of three workshops in a series. Class is for Moms & babies ages 6 weeks to pre-crawling. 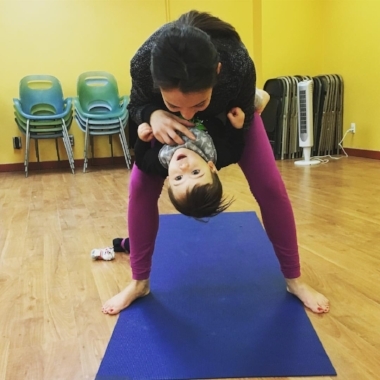 Mom & Baby Yoga classes are offered throughout the year. This special class is available for new mothers and their baby, (6 weeks to pre-crawling stage). Class includes time to connect and share with other moms, followed by yoga for both mom and baby. This is a unique class because it is a mother's support circle + yoga combo. Class is designed to be interactive and playful and offers time to bond with your baby and other new moms. This class offers a gentle and safe space to form a loving relationship with your new postpartum body, bond with your new baby and be part of a special community of new moms. Please bring a blanket for your baby to lay on, a small snack, water, and any other baby related items you may need to feel comfortable. Kid & Tween Yoga is a special offering for kids ages 5-9 and 10-13! 10% discount for siblings, enter code ‘SIBLINGDISCOUNT’ at checkout. Pre-register for these workshops. No experience necessary. Baby, Toddler, & Kid's Yoga with Paso Robles Recreational Services! A Parent Participation yoga class! Register through the City of Paso Robles HERE! Yoga comes to life in these fun and creative classes designed to stimulate a young child’s growing curiosity. Playful Yoga poses, animated breathing exercises and imaginative relaxation techniques, teach babies, toddlers and young children about their growing bodies. Sprinkled with music, picture books, and age appropriate props, we’ll spark the child’s inner yogi while enhancing language development, motor coordination and play skills. Classes are an equal balance between active and passive poses. In this parent participation yoga class adults and little yogis gather together to share in the fun and relaxation of yoga. We'll explore practices together that will help build strong family & caretaker connections. Classes are for ages 7 months to age 5. FREE CLASS DEMO on THURSDAY Feb 7th! Pre-register HERE to save your free demo spot! We'll explore practices together that will help build strong family & caretaker connections. Classes are for ages 7 months to age 4. In Kids Yoga ages 8-12 we will learn skills that can enhance their everyday lives in learning mindfulness, visualization and concentration strategies. We will have fun in building strength, flexibility, and team/partner yoga poses! Singing, Dancing, art, and being creative is all part of our Kids Yoga experience! Pre-register for this workshop. No experience necessary. Join Vanessa Orr for a Rise & Shine Hatha Yoga class at Dharma Yoga Loft! Vanessa of Yaya Yoga ca will be teaching a special Family Yoga class at the Whale Rock Music Festival from 2:30-3pm! Yoga is free with admission ticket! Bring your yoga mat and come join us! In family yoga adults and little yogis ages 4+ will gather together to share in the fun and relaxation of yoga. We'll explore practices together that will help build strong family & caretaker connections. In Kids Yoga ages 6-10 we will learn skills that can enhance their everyday lives in learning mindfulness, visualization and concentration strategies. We will have fun in building strength, flexibility, and team/partner yoga poses! Singing, Dancing, art, and being creative is all part of our Kids Yoga experience! Drop-ins welcome! No experience necessary. Kids Ages 6-10 please come join us this summer for a fun yoga and mindful art workshop! Kids will learn skills that can enhance their everyday lives in learning mindfulness, visualization and concentration strategies, strength, flexibility, and team building yoga poses. This workshop can teach kids skills to help reduce anxiety and increase an overall sense of well being. Along with Yoga we will create mindful art/crafts that can be utilized in the home or at school. This workshop is great for kids who are looking for a summer activity that will help prepare them for their first days back to school! 10% discount for siblings, use code SIBLINGDISCOUNT at checkout. Adults and kids/teens ages 8+ will gather together in this special workshop that focuses on Gratitude for the things & people we have. We will do some partner & group yoga asanas and end the class with restorative resting poses to help us relax. Use code "SIBLING" DISCOUNT" at checkout to receive 10% off a sibling enrolled in this series. Only $10 for a sibling enrolled! Enter code "sibling10" at checkout. There will be a class max of 12 kids for this workshop. It's Winter Break for kids! Such a great time after the Christmas Holiday to have kids re-ground, re-set, and find some calm. In this 60 minute workshop we will focus on tools that can help reduce anxiety and increase an overall sense of well-being. We will learn mindfulness, visualization, and concentration techniques to help improve their everyday lives. We will learn yoga poses that will help build strength, flexibility, and working as a team/partner. We will end the class with a mindfulness craft project that can be taken & used at home! If you plan to attend our Kids Yoga winter workshop please pre-register by 7pm Dec 26th so I can prepare enough materials for all participants aka free gifts! 🎁 ❤️ A hint in the pic. Family Yoga for up to 4 family members at Dharma Yoga Loft. In this family yoga class adults and little yogis will gather together to share in the fun and relaxation of yoga. We'll explore practices together that will help build strong family & caretaker connections. Ages 2-5: It's winter break for kids! This is a great time to spend some one-on-one time with your little yogi! Yoga comes to life in these fun and creative classes designed to stimulate a young child’s growing curiosity. Playful Yoga poses, animated breathing exercises and imaginative relaxation techniques, teach toddlers and young children about their growing bodies. Sprinkled with music, picture books, and age appropriate props, we’ll spark the child’s inner yogi while enhancing language development, motor coordination and play skills. Classes are an equal balance between active and passive poses. Register for this Workshop HERE! If you plan to attend our Family Yoga winter workshop please pre-register by 7pm Dec 26th so I can prepare enough materials for all participants aka free gifts! 🎁 ❤️ A hint in the pic. $20 Drop‐in, Includes 2‐3 family members. Toddler & Kid's Yoga with Paso Robles Recreational Services! Vanessa Orr will be hosting a FREE Family Yoga Workshop! Location: Paso Robles Youth Arts Foundation, 3201 Spring St. Adults and little ones gather together to share in the fun and relaxation of yoga. We will explore practices we can do together to build strong family and caregiver connections. Register by June 24th & receive $15 off the series! Can't Make all the classes? We will honor one missed class in our fall series beginning September 7th! Adults and little people gather together in this 30 minute class to share in the fun and relaxation of yoga. We’ll explore practices that we can do together to help build strong family & caregiver connections. Yoga Mats provided or bring your own. Yoga comes to life in these fun and creative classes designed to stimulate a young child’s growing curiosity. Playful Yoga poses, animated breathing exercises and imaginative relaxation techniques, teach toddlers and young children about their growing bodies. Sprinkled with music, picture books, and age appropriate props, we’ll spark the child’s inner yogi while enhancing language development, motor coordination and play skills. Classes are an equal balance between active and passive poses. In this family yoga class adults and little people ages 1-5 gather together to share in the fun and relaxation of yoga. We'll explore practices together that will help build strong family & caretaker connections. Family Yoga is for adults and their kids ages 1-5. Adults and little people gathered together to share in the fun and relaxation of yoga. We’ll explore practices that we can do together to help build strong family connections. The recommended ages for children are ages 4 – 10, but everyone is welcome.